Styling beaded jewellery is arguably second nature to you; people have been drawn to the beauty of beads for thousands of years. Originally made from materials including clay, shells, and even animal bones, they have been used to create jewellery and artwork since the dawn of mankind. We've highlighted some of our favourite pieces and given top tips on how to style beaded jewellery so you can see why beads have been a frontrunner in the style stakes for centuries. The Ancient Egyptians used beads to make majestic collar necklaces worn by queens and pharaohs; the French created intricate floral patterns with glass beads in the 1600s, and flapper girls wore beaded tassels as they danced through the Jazz Age of the 1920s. And now you can join the trend! Traditionally, beads were made from natural materials, such as wood or stone. Today, this gives them an organic quality, which fits perfectly with the raw and rustic attitude that defines bohemian style. They're a great choice for anyone who likes to rock a Mother Nature-inspired look or can't resist a bit of 1970s glamour. If you want to channel a bohemian vibe with an elegant twist, this sterling silver bracelet (Â£98) by Thomas Sabo captures the look perfectly. 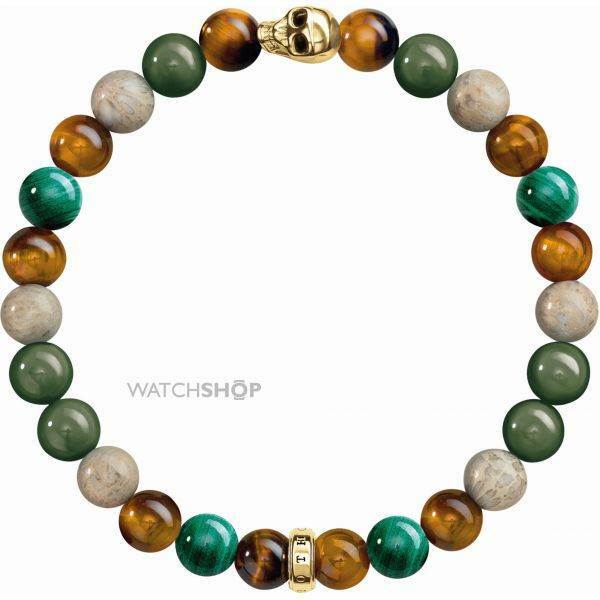 The tones and textures of the beads have an earthy feel, blending turquoise, amber, khaki, and marble-white for a refined yet natural effect. Because of the range of colours and tones, this bracelet will pair effortlessly with everything from a neutral blouse-and-trouser combination to a standout turquoise cocktail dress. The gunmetal PVD beaded bracelet (Â£53) by Diesel Jewellery has a classic bohemian vibe, with simple wood-effect beads and a gunmetal clasp. 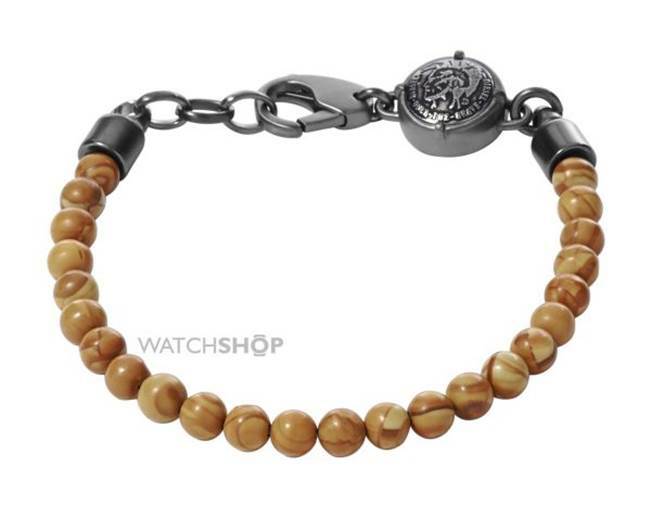 The natural brown tone gives this bracelet a surfer vibe, while the rustic metal adds a touch of edgy detail. A casual accessory, it will add a bit of fun to a simple jeans-and-t-shirt combination and pair especially well with sunny days at the beach. If you want to rock your beads in a retro fashion, there's no need to go as far back as the '70s (unless you want to!). The noughties were all about candy-shop colours and having fun with design, which makes beaded bracelets a great way to channel the decade. Irresistibly cheerful, this Heart & Tassel beaded bracelet (Â£45) by the always-fun Juicy Couture will bring a pop of excitement to any ensemble. Featuring bubblegum-pink beads, a girly purple tassel, and a PVD gold plated heart, it screams '00s nostalgia. The circular beads in this men's silver plated bead necklace (Â£17) by Icon Brand are both fun and understated. Jet black, cool indigo, and baby blue create a sophisticated colour block pattern, with a hint of added shine from the silver-plated beads. It'll look fresh against a white t-shirt and blend in casually with a navy blazer or button-down. There's nothing to stop you upgrading a necklace or bracelet with beads. Because beads come in an endless range of shapes, colours, and styles, they can be used to make a personalised piece of jewellery, and even a present that has sentimental value. For a modern take on the classic art of beading, chains like this sterling silver karma beads necklace (Â£90) by Thomas Sabo are meant to be dressed up with a unique selection of beads that suit your taste. From heart-shaped designs to rich jewel tones, you can create a unique piece that reflects your personality. For a quirkier take on build-your-own beaded bracelet, Persona creates wild and whimsical beads and charms that are perfect for anyone who likes to be a little different. 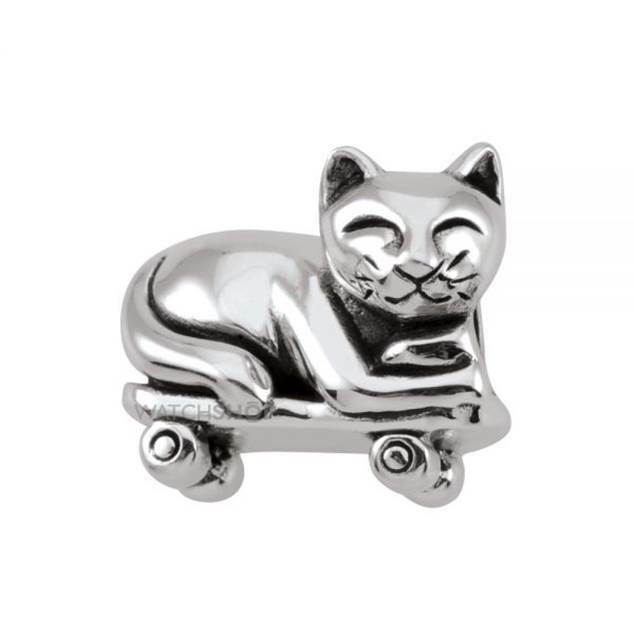 You can mix and match cheeky designs like the On a Roll (Â£30) cat on a skateboard, with everything from emojis to unicorns, to piece together a bracelet that reflects exactly how fun and wacky you are. Beads can be the starring feature of all kinds of jewellery, from intricate necklaces to chandelier earrings. Whether you opt for a formal or casual design, you can choose a piece that will stand out and help you make a statement. Bright white beads are contrasted against a rainbow pattern to create a vibrant design in this bead bracelet (Â£15) by Icon Brand. To finish off the eye-catching design, a gold-plated skull sits proudly in the centre, ready to add a flash of rebellious style to your everyday. If you want to turn heads at your next formal event, opt for a statement necklace. This sterling silver beaded necklace (Â£150) by Links of London is dainty and elegant, featuring teardrop-shaped beads along a slinky sterling silver chain. It'll look beautiful paired with dark wash jeans and pair of heels, and steal the show when styled against a little black dress. Whether you're after a quirky and fun design or a timelessly elegant piece, join the age-old trend and embrace beaded jewellery - you can browse the full range to find the perfect piece that fits effortlessly into your wardrobe.